Lonely Island comedians Jorma Taccone, Andy Samberg and Akivah Schaffer pose in front of a utility box adorned with a painting of themselves, outside their old school, Berkeley High, in November 2012. WATCH: Andy Samberg, Chelsea Peretti in 3rd Grade Production of "Annie"
Little did dad know, when his son grew up, he’d be hired by Lorne Michaels as a writer and featured player on “Saturday Night Live”, which is celebrating its 40th anniversary on Sunday. Since departing "SNL," Samberg has become a leading man, taking home the 2014 Golden Globe for Best Actor in a Comedy Series for his role on "Brooklyn Nine-Nine." The Lonely Island boys were "inseparable"
Berkeley Unified School District spokesman Mark Coplan, who used to work in the schools when Samberg was a teen in the 1990s, said Samberg and friends Akiva Schaffer and Jorma Taccone, who joined the "SNL" writing staff at the same time as Samberg, were quite hilarious. All three met as sixth graders at Willard Middle School in Berkeley and continued on as friends at Berkeley High and beyond. In 2000, they established a comedy group, called The Lonely Island, a name that reflected their time in Los Angeles as they struggled to make it big in comedy. 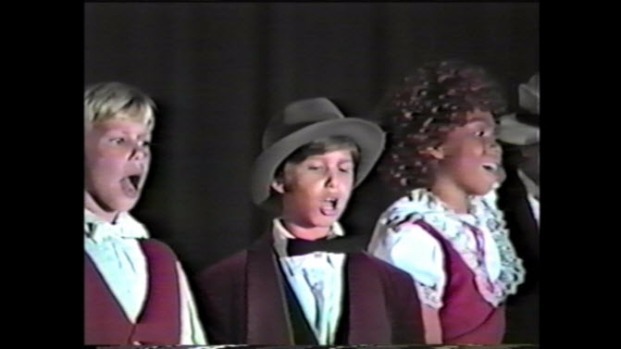 Andy Samberg mugs for the camera as a 3rd grader in 1986 after performing in the Chabot Elementary School play, "Annie." All three were recruited to work for "SNL" in 2005, a job they held until 2012, popularizing and leading the "SNL" Digital Shorts division. In January 2012, the three pals helped facilitate the largest donation to the Berkeley Unified School District in history: $250,000. A total of $75,000 went to the “Metal Shop Theater” at Willard Middle School and the rest went to pay for a theater manager and other equipment to revive the “Berkeley High Tech Crew” at Berkeley High School. Such acts of generosity did not surprise the friends' former educators. Nor were they surprised when the boys grew up to be world famous comedians. In 1986, Kyle Wong was Samberg’s third grade teacher at Chabot Elementary School in Oakland, where he is now approaching his 30th year. Wong held onto Samberg’s class photo and even has a VHS copy of the school play, “Annie,” featuring Samberg as “Daddy Warbucks” and classmate Chelsea Peretti in a smaller role. Peretti, a highly successful comedic actor in her own right, co-stars with Samberg on "Brooklyn Nine-Nine." Actor and Saturday Night Live writer Andy Samberg played Daddy Warbucks at Chabot Elementary School in Oakland in 1986. Samberg was in Kyle Wong's third grade class, along with classmate Chelsea Peretti, who now co-stars with Samberg in the TV show, Brooklyn Nine-Nine. Former classmate Eric Thompson remembers Samberg being super silly and "SNL"-bound from a young age. Andy Samberg (top right) and Chelsea Peretti (top row, second from right) are pictured in the Chabot Elementary School class picture in 1986 as 3rd graders. The two now co-star in Brooklyn Nine-Nine.